There is always one place that can raise Elliot’s spirits: Duluth, Minnesota. After he was diagnosed with leukemia when he was 2 ½ years old, Elliot’s parents would take him to Duluth’s Canal Park near the shore of Lake Superior. Watching the boats and the lift bridges was always a respite from his debilitating chemotherapy treatments. Since its founding in 1948, the Jimmy Fund has supported the fight against cancer in children and adults at Boston's Dana-Farber Cancer Institute, helping to raise the chances of survival for cancer patients around the world. Since 1998 Hyundai and its dealers have been committed to supporting the fight against childhood cancer. What began in 1998 as a local initiative supported by New England-area Hyundai dealers to raise funds for the Jimmy Fund at Boston's Dana-Farber Cancer Institute has evolved into Hyundai Hope on Wheels, an independent 501(c)(3) nonprofit organization which is supported nationwide by all of Hyundai's more than 800 dealers and Hyundai Motor America. Since 1980, the Make-A-Wish Foundation® has given hope, strength and joy to children with life-threatening medical conditions. From their humble beginnings with one boy’s wish to be a police officer,they've evolved into an organization that grants a child’s wish in the U.S. every 40 minutes. The Jimmy Fund started in 1948 when the Variety Club of New England (now the Variety Children's Charity of New England) and the Boston Braves baseball team joined forces to help a 12-year-old cancer patient dubbed "Jimmy." On a national radio broadcast, millions heard the boy visit with his heroes from the Braves as they stood by his hospital bed. Contributions poured in from people everywhere, launching an effort that continues to bring hope to thousands of children and adults facing cancer throughout the world. Join this more than 50-year tradition of support by making a gift to the Jimmy Fund. The Hope on Wheels Tour is the united effort of Hyundai dealers across the country to raise awareness about childhood cancer and celebrate the lives of the courageous children battling the disease. In 2010, the Hope on Wheels Tour traveled to 42 children's hospitals across the country and donated more than $2 million to support further training and research for doctors involved in childhood cancer research. Hyundai Hope on Wheels designates the medical professionals supported by these donations as Hyundai Scholars. Barrett Jackson - Palm Beach 2015 - Philanthropists and world-renowned car collectors Jeanette and John Staluppi donated an additional $100,000 to support the Achilles Freedom Team. WEST PALM BEACH, Fla. – Longtime foundation supporters John & Jeannette Staluppi purchased the Garlits vs. Gwynn Dragsters (Lot #3006) from the Darrell Gwynn Foundation for $100,000 at Barrett-Jackson Palm Beach on Saturday, April 7 hosted by the South Florida Fairgrounds. The car was donated back to the Darrell Gwynn Foundation by Ron Pratte after he purchased them at Barrett-Jackson Scottsdale. Proceeds from the sale of these cars benefit the Darrell Gwynn Foundation's mission to SUPPORT people with paralysis and PREVENT spinal cord injuries. "What an amazing gesture by John Staluppi," said Darrell Gwynn. "They've done so much for us and did so much for us this week I just can't thank them enough. Their generosity propelled our mission so much this week. I just thank them and may God Bless them." In addition to purchasing the Garlits vs. Gwynn Dragsters, John & Jeannette Staluppi hosted "Wheels of Dreams", a fundraiser at their Cars of Dreams Museum to benefit the Darrell Gwynn Foundation on Thursday night and donated the 1960 Chevy Impala to the foundation that sold or $70,000 on Friday to Joe Riley at Barrett-Jackson Palm Beach. Also, while on stage at Barrett-Jackson Palm Beach several Barrett-Jackson bidders and supporters pledged their generosity by making donations to the Darrell Gwynn Foundation collectively totaling approximately $30,000. While on stage, the Darrell Gwynn Foundation donated a $24,000 "Mini-Mouse" themed power wheelchair to 4 year-old Madison Wilson of Miami. Madison, who is diagnosed with Cerebral Palsy with complications was denied the power wheelchair she needed by Medipass. She is a patient at the Ann Storck Center and she was referred to DGF by Joe DiMaggio Children's Hospital. Her new power wheelchair will give her the gifts of mobility and independence and allow her to start school next fall. NORTH PALM BEACH, Fla. – The Darrell Gwynn Foundation, on behalf of its donors, donated a $13,500 "Batman Themed" wheelchair to Tyler Wright, a six year-old from Pompano Beach, Fla. "Wheels of Dreams" Gala at the Cars of Dreams Museum on April 5. Tyler, a well-liked student at Charles Drew Elementary School, is diagnosed with cerebral palsy and could not propel himself in his old manual wheelchair. Medicaid denied his claim for the proper wheelchair he needs. The new power wheelchair will give him the gift of mobility he needs so he can ride the bus to school on his own and engage more with his classmates as well as be more independent at home. The donation was made through the Darrell Gwynn Foundation's national Wheelchair Donation Program. Tyler in his new Batman themed wheelchair complete with cape and mask was able to visit with his family a replica of the famous "Batmobile" which is on display at the Cars of Dreams Museum. The event was hosted and underwritten by John & Jeannette Staluppi. Proceeds from the event benefited the Darrell Gwynn Foundation's mission to provide SUPPORT for people with paralysis and PREVENT spinal cord injuries. 3/10/12 - Palm Beach Post - "Vroom in your heart? You can help Hospice"
Hundreds of vintage hot rods, classic cars and new luxery vehicles will be on display Sunday at the fourth annual South East Rods and Customs Cars of Dreams Show and Raffle. The show will be held at the Cars of Dreams Museum, 133 U.S. 1 and a nearby lot. More than 4,000 classic-car enthusiasts are expected to attend the event, which includes a car show featuring restored classic cars and trucks, hot rods and luxury vehicles, food vendors and a tour of the private Cars of Dreams Museum. Admission to the car show, which runs from 9.am to 4 pm, is free. The museum will be open from 9am to 2:30 pm. Admission is $10, with proceeds benefiting the Hospice of Palm Beach County Foundation. The Cars of Dreams Museum, owned by John Staluppi and his wife, Jeannette, houses a comprehensive classic-car collection spanning more than 50 years, a hand carved carousel, a 1950's-era garage, a fire station and a town square. Staluppi opens the museum to the public just twice a year for charity events, including the Shop With a Cop fundraiser sponsored by the Palm Beach County Sherriff's Office. "It's just amazing," said Lauryn Barry, special events manager for Hospice of Palm Beach County. "It's formatted like an old-time, '50's town." For this event, Staluppi donated a 1979 Pontiac Firebird Trans Am as part of the raffle. Hosted by the Palm Beach County Sheriff's Office, and held at the Cars of Dreams Museum, 133 US 1, this show is open-to-all, benefits the Shop With A Cop program, and includes awards, raffles, DJ, and giveaways. Pre-registration includes two museum entries and a T-shirt, and is $30. Day of show registration is $35, and includes two museum entries. Spectator museum entry is $10, and lunches are $5 each. For more info, call Carol at (561) 688-3983. Cars of Dreams Museum Fundraiser for Darrell Gwynn Event "Wheels of Dreams"
More than 300 guests enjoyed a magical “Wheels of Dreams” evening at John and Jeanette Staluppi’s fabulous Cars of Dreams Museum in North Palm Beach March 30th. Amid a wonderland of classic cars, Darrell, “Big Daddy” Don Garlits, and NHRA personality Bob Frey took everyone on an entertaining “Behind the Scenes” look at the world of cars and racing and the camaraderie it engenders. Miami Children’s Hospital Foundation (MCHF) is a non-profit organization whose sole mission is to create awareness and generate funds for Miami Children’s Hospital (MCH), the only licensed specialty hospital in South Florida exclusively for children. The Foundation’s guiding principle is to ensure that all children have access to state-of-the-art pediatric care. (Excerpt from Article Above) This event raised more than $400,000 for the American Heart Association. The success of this important fundraiser is due not only to its venue, but equally to the countless hours of service by the event chairpersons Julie Shrewsbury and Dr. Frank Cook, event co-chairpersons Terri and Kevin Justice and their energetic event committee of workers. John and Jeanette Staluppi served as the patron honorary chairpersons along with Dr. Richard Faro who was the medical honorary chairman. Hats off too, to the tireless efforts of Heart Associations staff members Pam Calzadilla, Jodi Riche and Kristen Cruz. (Excerpt from Article Above) Car nuts like Jerry Seinfeld and Jay Leno have huge car collections….and they help charities. John Staluppi of Palm Beach Gardens can give them a run for their money…..on both counts. Mr. Staluppi started his collection about 10 years ago with just two cars. Now his collection has grown to more than 100 cars. For three decades, Hospice of Palm Beach County has served our community as the leading provider of hospice and palliative care, never losing sight of our commitment to provide services to all those who turn to us for help, regardless of their ability to pay. Hospice of Palm Beach County Foundation was established to support the organization’s longstanding services and programs. Such programs include the Necessities of Life program, The Hospice & Palliative Medicine Fellowship program, Integrative Therapies (which incorporates palliative massage, Reiki, aromatherapy, imagery and relaxation training into the patient’s treatment) and the John J. Brogan Horizons Bereavement Center, which provides services to hospice families and the community at large. Our bereavement programs have served more than 800 adults, teens and children in 2008 alone. In addition to programs and services, the Hospice of Palm Beach County Foundation also supports numerous other community services and events, as well as provides funding for innovative research projects and for the development of new programs. 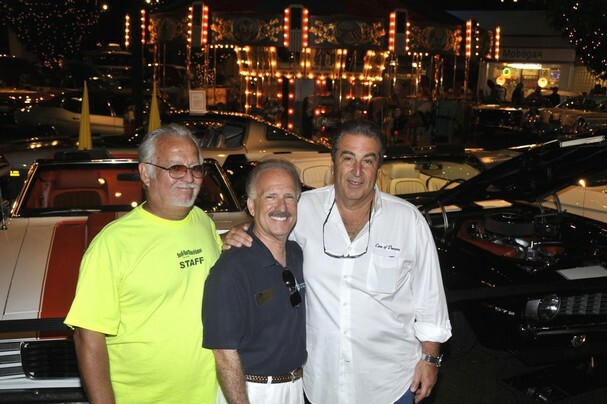 John Staluppi supports Palm Beach County Hospice Foundation through his successful annual fundraiser at the Cars of Dreams Museum and in turn with their efforts to care for those in need within the community. John Staluppi knows he has the ability to make a difference in the lives of children who are battling life-threatening medical conditions. Through John Staluppi's generosity the Make a Wish Foundation have never turned away a medically-eligible child. Over the years John Staluppi has been responsible for making the wishes of so many children come true. By adopting a child's wish, John Staluppi becomes a part of the magic of Make-A-Wish. Make a Wish has acknowledged John Staluppi's contributions. But most importantly, of course, is the satisfaction of knowing that John Staluppi has made a difference in the lives of children by making his or her wish come true! I f you would like to follow in the example of John Staluppi you too can make a wish come true. Remember wishes are like children - each one unique. Therefore, the cost to fund a wish varies widely depending on the nature of the wish and the geographic location of the child. The average cost of a wish is $5,000. You don't need to be John Staluppi to give a child the priceless gifts of love, laughter and treasured memories by sponsoring his or her wish for $5,000. For a contribution of $2,500 your donation will be partnered with another donor to make a child’s wish come true. Fulfilling the Make a Wish Foundation mission of granting wishes to children with life-threatening medical conditions would not be possible without the generous financial support of donors in the community like John Staluppi. Behind every child's wish, there are special individuals, corporations, student organizations or foundations that made it possible. In fact, every unforgettable wish we grant is funded by private contributions. When you Adopt-A-Wish, you impact a family and create hope, strength and joy during a time when a family needs it most. The Make a Wish Foundation salutes their generous donors like John Staluppi who adopted wishes during our last fiscal year and those who made a child's wish come true during the current fiscal year. Thanks to John Staluppi and to the generosity of all involved. (Excerpt from JohnStaluppipb.com)to the generosity of all involved.